For decades he resisted Nazi, then Communist, oppression. How did he cope? up to the day he became Pope John Paul II (1978). He was becoming a man of prayer, and preparing for future usefulness, but was also very much involved in the crazy realities of life with his people in the hell that was Nazi Poland. 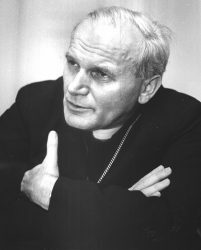 Karol Wojtyla, (pronounced something like “VoyTEEya”) was known as a man of prayer, and it seems to me that his life-long habits (and style) of prayer – developed in his late teens – were a key factor in his effectiveness in the real world and in his continuing rise to greater and greater worldly power. 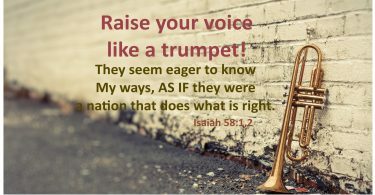 by an older man (Jan Tyranowsky) who became a spiritual mentor to several young adults. I was familiar with the story from previous study, and though this version is a movie, not a documentary, it still rings pretty true. One poignant scene shows him discovering a poster announcing the murder (“execution”) of a good friend, a young priest, by the Nazis. Wojtyla sinks to the ground in sorrow as people walk by. His whole world has become one of violence and insanity, and his friends are being destroyed. But as he slumps there against the wall in sorrow and presumably in despair, he is holding a book Tyranowsky had given him, by St. John of the Cross on prayer. What a bizarre juxtaposition that scene presents. A strong, intelligent, active, well-liked young man slumped in despair as the Nazis destroy nearly all that is of value to him – and clearly threaten his own life – yet he is holding on to the obscure work of an obscure and very non-violent monk from four hundred years prior. Fortunately, he did not listen to me. Throughout the Nazi occupation Wojtyla kept working (in a quarry), he kept praying, and he kept secretly preparing for ordination as a priest of the Roman Catholic Church. He was also involved in an underground protest drama group. He was becoming a man of prayer, and preparing for future usefulness, but was also very much involved in the crazy realities of life with his people in the hell that was Nazi Poland. In the movie Tyranowski tells the future Pope that they have to win by love, not by violence. The Nazi form of the evil will go away; but if they do not win by love, it will only return under another name. II. How Did He DO That? The evil returned, perhaps a little less viciously, under Communist rule when WWII ended in 1945. The Communists, after all, at least hoped to develop some economic activity in Poland. — i.e. converse with them, and actually on occasion win a concession or two. Of course it’s just a movie — we don’t know the actual substance and “dance” of those conversations; and besides, they were in Polish, not English like in the movie. But it was a complex and dangerous environment and required the utmost in integrity, good judgment and sensitivity. Some of those leaders wanted him dead. Others thought his continued presence was important, and that he could perhaps be manipulated. He always expected to die a martyr’s death. Still, he walked into these lions’ dens and talked with them. And thus he played a significant part in the eventual collapse of Communism in Poland. How could he walk into those offices and maintain his integrity and still on occasion actually achieve some good? What are the tricks and tools of such operations? “How did he DO that?” How did he know what to say, what strategies to use? Then a couple of days later I found this awesome quote in Dallas Willard’s The Spirit of the Disciplines: Understanding How God Changes Lives, p 185. How misguided are those who regard prayer as irrelevant to social conditions! Bingo! “… stupid policies … grasping … suspicion … resistance to good” Willard is writing about our own days, our government, schools, religious establishments, media, economic interactions, etc. What Wojtyla faced was perhaps more blatantly violent and volatile. Unfortunately the general tendency is the same, as is the certainty of our frustration in trying to deal with it all. Then Willard quotes O. Hardman’s The Ideals of Asceticism from 1924. Continuing instant in prayer, after the conclusion of each period of definite communion with God, he will set himself to undertake every legitimate risk, to do the right without fear of consequences, and to embrace in loving purpose those who are opposed to him no less than those who are in agreement with him, in the attempt to realise the vision and to exercise the sympathy with which prayer has endowed him. Sounds like what SHOULD come from real prayer. A higher, truer perspective, and much wiser and more powerful. And one the world often does not want to welcome. … that living unity which is experienced by him in anticipation when, in his moments of intensest prayer, he is caught up to God and filled with the joy of union. Mystical? Yes. But also true. Economic, social, political, national, and racial antagonisms are waiting for this sole solution of the deadlock which they present. There is no other way. Does that mean we need do nothing else? Well, duh. Of course not. 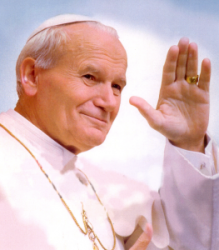 The people from whom we learn these things, including Wojtyla himself, were very active and have tended to have considerable impact on the world. I am not Roman Catholic, nor could I in good conscience become Roman Catholic. 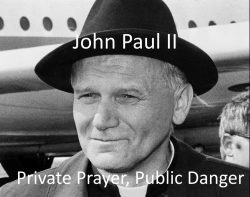 There is much in the spiritual practice, theology, and actions of John Paul II that I can not subscribe to. But there is much there for all of us to learn from. We likely would do more good for the world by imitating him than by ignoring him. Then Willard adds some further comments of his own. No doubt many things called “prayer” are quite useless in every respect, but nothing is more relevant to social conditions than the transformation of persons that comes from prayer at its best in the life of the disciple of Christ. We probably had better be living lives of prayer. Karol Wojtyla is one very real example of that. There have been many others – may there be many more! The quotes are from a three-page section on “Prayer” in Willard’s book. Short, but it’s a very good three pages – probably worth the price of the book. Certainly worth a trip to the library. Hardman’s book, which I have read, is also valuable, though more difficult, and also probably worth a trip to the library. How could Hardman have written such things, and Willard have wisely quoted him, if they had not both had some level of experience with it? It sounds to me like the voice(s) of experience here. Otherwise, how would they know? Who could believe it without experience? Dallas Willard. John Paul II. O Hardman. The Ideals of Asceticism. The Spirit of the Disciplines. “Must Speak Out” – You Could.